Are you ready for even more intimacy with Jesus? Song of Songs 1:2-4 Let him kiss me with the kisses of his mouth-- for your love is more delightful than wine. Pleasing is the fragrance of your perfumes; your name is like perfume poured out. No wonder the young women love you! Take me away with you--let us hurry! Let the king bring me into his chambers. We rejoice and delight in you; we will praise your love more than wine. How right they are to adore you! 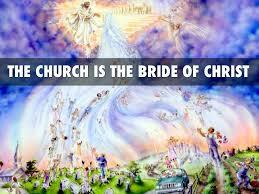 Rev 19:7-8 The marriage of the Lamb is come, and his wife hath made herself ready. And to her was granted that she should be arrayed in fine linen, clean and white: for the fine linen is the righteousness of saints. Jesus is not just looking for us to know about him or just to have faith in him. He wants us to know that we are one with him, like a husband and wife. Intimate intertwined lives full of love, grace and safety as Jesus, our husband cares for us. This is not talked about much, I think because men find the bride type imagery hard to relate to. But in fact it's very similar to the picture the Scripture use of us, both men and women being son of God (Ro.8:17), something for the ladies to get their heads around.